What Happened During the Skittles the Musical Commercial? 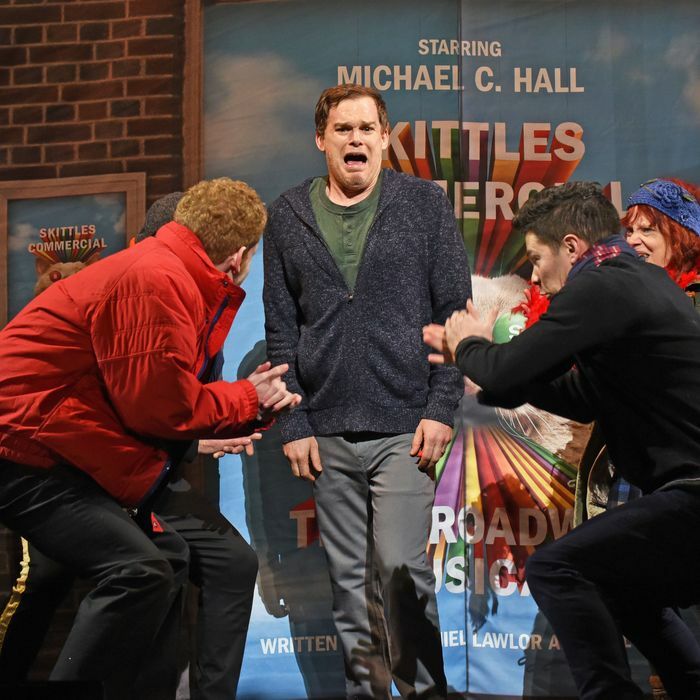 Midway through Skittles Commercial: The Broadway Musical, which performed on the Great White Way Sunday afternoon, Michael C. Hall dies. To be clear, that’s not the Michael C. Hall you know and love from things like Six Feet Under and Dexter, but the version of Michael C. Hall that Michael C. Hall was playing in this commercial/Broadway musical. I don’t feel bad spoiling the plot because it is apparently doing only one performance, and because Michael C. Hall’s death was at least the third most absurd thing to happen over the course of the roughly 45-minute event, which concluded with a rainbow-colored dress change that wasn’t not a reference to Frozen. Welcome to corporate candy meta-theater. The Mars company, which owns Skittles, decided to stage a musical, by all accounts, as a way to counterprogram the Super Bowl. The joke being that instead of airing something for an audience of millions, they’d make people buy tickets to go see the show in New York thus standing out from all the other brands for being cool and different. If anything, they overcommitted. Will Eno, of self-referential dramas like Thom Pain (which Hall starred in last fall), wrote the self-referential book along with copywriter Nathaniel Lawlor. Sarah Benson, of the daring Soho Rep, directed. Drew Gasparini wrote the show’s rock ballad–esque music. Like any serious piece of theater, they did a process piece in the Times. They released a cast album, which includes four minutes Michael C. Hall eating Skittles, both sparking and fulfilling a fetish I now have. There’s a now-defunct tradition of industrial musicals, song-and-dance shows staged by corporate management and salespeople, that this Skittles musical feels like an outgrowth of, though it’s more preoccupied with the question of how the audience feels than the product itself. The characters barely talk about the qualities of Skittles as candy. There’s nary a mention of sour Skittles, for instance, nor are there any jokes about the health costs of eating too much sugar — that, one feels, would be off-limits for corporate. But there is a whole lot of talk from the actors playing audience members about their frustrations with advertising in general. “It ruins the web and it ruins TV / And it fills our inboxes with spam,” one sings in the song “Advertising Ruins Everything.” “And there’s nothing we hate more / Than each tiny paid for / Targeted ad served up on Instagram.” These people just want brands to leave them alone, or at least to work hard to win them over. For all its postmodernism, the musical feels quaint and nostalgic in a way. Remember when brands had to fight for your attention, it seems to argue, instead of micro-targeting you by mining the data other corporations harvest from you online? Or rather, it’s something like: We’re selling you something, but isn’t it at least better that we admit we’re selling you something? Is it? According to Skittles, the ticket proceeds from the performance were donated to Broadway Cares/Equity Fights AIDS, and the show looked nearly sold out when I arrived. I’d gotten a press ticket, which came with two complimentary packs of Skittles (others could buy them in the set of a bodega onstage before the show) and a copy of the script, which a Skittles press rep promised would allow me to check if what happened onstage “really did happen.” There’s a self-satisfaction about the whole thing that’s hard to shake, as if Skittles knew it had a winning idea before the show even went on. Then again, it was a winning idea, and it would be written up in many different publications, including this one. Then again, imagine if this group of people involved in Skittles Commercial: The Broadway Musical got to make something this clever about something that didn’t involve candy. Then again, how would that thing exist? Who has the money fund it? Is it complacent to throw up your hands and refuse to enjoy something that’s part of a broken system, or is it complacent to enjoy something that’s a product of that system, despite its compromises?